We were inspired by their commitment to high-quality standards, family values and deep understanding of launching and growing a world-class branded plant program. Fall Creek Farm & Nursery, Inc., the world’s leading blueberry nursery stock and breeding company, has formed a strategic alliance with zu Jeddeloh Nurseries, family run for seven generations and one of Europe’s leading container nursery growers, to launch the BrazelBerries Collection of ornamental berry plants into German garden centers in 2016. 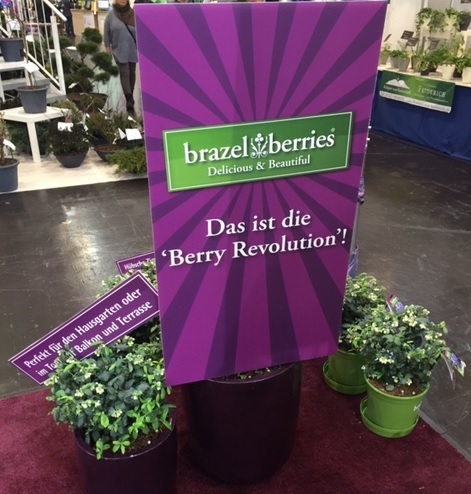 Introduced by zu Jeddeloh to the European market in January at the IPM trade fair in Essen, Germany, the BrazelBerries Collection received the new plant innovation award in the “woody plants” category at this year’s show. According to Amelie Brazelton Aust, a second-generation owner of Fall Creek Farm & Nursery, the American nursery knew from the first meeting that Jeddeloh was the right partner. “We were inspired by their commitment to high-quality standards, family values and deep understanding of launching and growing a world-class branded plant program,” says Aust. In 2004, zu Jeddeloh acquired one of the licenses for and began marketing the Endless Summer® Collection of hydrangeas in Europe. BrazelBerries is a new plant brand that includes new varieties of berry shrubs bred specifically for home gardeners. They are simple to grow, offer year-round beauty and produce delicious, abundant fruit. Unlike most berry bushes, these berry plants make excellent landscape shrubs and container plants. Jan zu Jeddeloh, owner of zu Jeddeloh Nurseries, agrees the relationship is a good fit. “The increasing popularity of growing fresh berries and the rise in small space gardening make this the perfect time to introduce this unique collection of small edible berries into the European market,” he explains. Marketing materials produced by zu Jeddeloh will emphasize the BrazelBerries extensive breeding program and unique family connection to Germany. Zu Jeddeloh says German retailers looking for display inspiration can visit its showroom in Edewecht, Germany, where the family has been cultivating the land for 15 generations. The BrazelBerries collection will be presented in a variety of innovative merchandising displays, using both the logo and branded pots with the same look and feel as the U.S. market. For more information, visit http://www.brazelberries.com or http://www.jeddeloh.de. From its state-of-the art growing facilities in Oregon, Fall Creek Farm & Nursery specializes in the propagation, production and global distribution of blueberry nursery stock. Fall Creek works with the leading nursery stock growers and retailers to bring consumers the very best that blueberries offer. Zu Jeddeloh Nurseries ranks among Europe's leading container nursery gardens and full-range producers of quality deciduous trees, fruit trees, conifers, rhododendrons, roses and perennials. A full-service provider, zu Jeddeloh is known for quality plants grown at its own production facilities, excellent customer service and professional marketing. 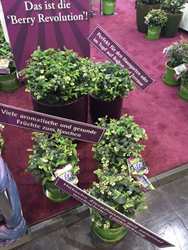 BrazelBerries Collection received the new plant innovation award in the “woody plants” category at the IPM trade fair in Essen.